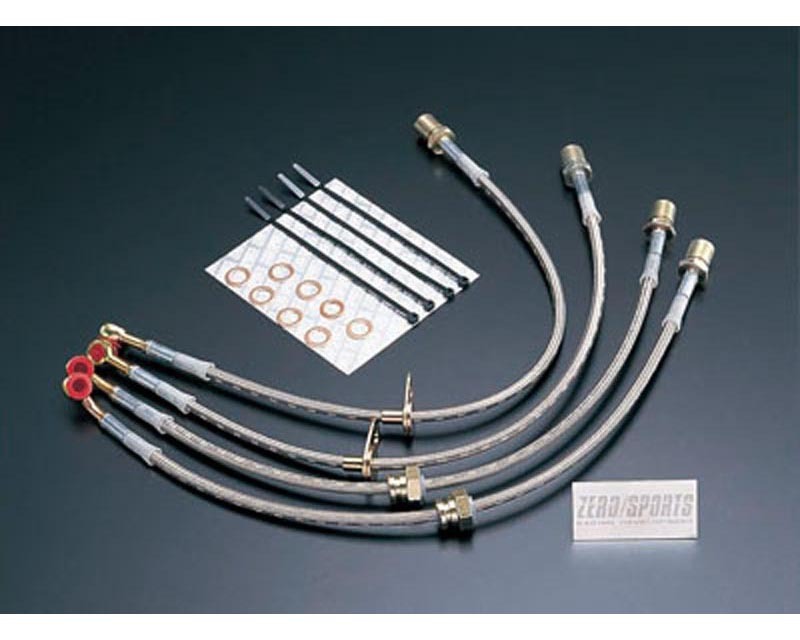 Improve your car’s braking power with these stainless steel brake lines from Zero/Sports! Constructed of high quality fluorocarbon resin tube, and covered by tightly braided stainless steel, the Zero/Sports steel brake lines prevent brake hose expansion under pressure. -The factory brake lines are made of soft rubber that expands under the pressure of braking. This expansion reduces the amount of fluid that is actually getting to your brakes. -Removing this expansion allows more fluid and pressure to reach your brakes, increasing your braking power. As a side result, the removal of the brake line expansion will stiffen your brake pedal, giving you a more responsive feel when braking. -The Zero/Sports lines are coated on the outside to protect them, and the swivel fittings allow tension to be removed from the lines when the car’s suspension moves. -Zero/Sports brake lines meet the Japanese Industrial Standards, which are based on ISO3996 standard (JISS2601 stipulation) and vehicle inspection correspondence.